With the start of the 2016-2017 school year, we are happy to welcome all of our students and parents to Connect program. We have had a wonderful start to the school year! Students have been busy team building, starting content, and exploring new projects. We would like to invite you to follow our bulletin this year as we share the in's and out's of our Dobie Connect classrooms. 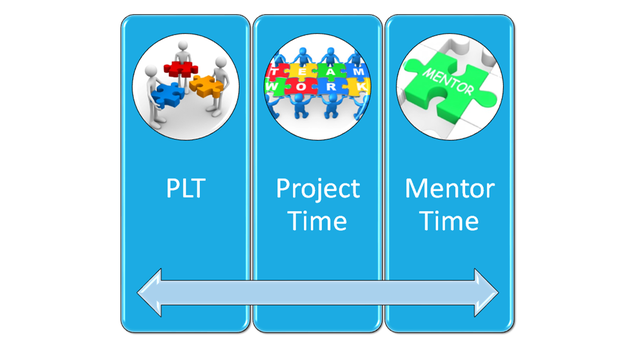 PLP, PLT, Project Time, OH MY! When your student comes home from school this year, you will most likely hear them referring to items such as their PLP or PLT. Through this bulletin, we will keep you updated on the new terms and what they mean for your student. The PLP, or Personalized Learning Plan, is a tool that houses the curriculum for students. Every student has their own PLP where they can set academic and personal goals, track progress, and receive feedback from teachers. The PLP is a tool that is designed to allow families and teachers to provide support and coaching for students. Parent logins are available to view your student's PLP. A sample of the PLP tool can be seen below. 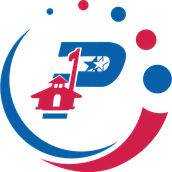 If you have not received your parent login, click here and instructions will be emailed to you to help you get started in the PLP. Click on the button above to login to the PLP. Personalized Learning Time (PLT) is the time during the week that students will focus on learning their content for their courses, such as Algebra, English, World History, etc. At Dobie, student's will have PLT time all day Monday and content specific PLT time throughout the week. The focus of PLT is to allow students to learn material at their pace using resources that are beneficial to their learning style. Students will take content assessments (tests) over the material they are learning to demonstrate their understanding. In the Connect program students are working on real world projects that are supported using the content they are learning for each subject. Students work through multi-week projects that lead student's to learn new cognitive skills that will help them to be successful in college and/or the work force after they graduate. The skills that student's are learning are referred to as cognitive skills. The skills are assessed using a rubric that is shared among all the classes, including math. During project time students work together on projects that are designed to strengthen their cognitive skills. Every student is provided a mentor teacher that will serve as their coach, advocate, and confidante. The mentor will help students to set goals, create plans, and make good decisions. Students are provided a 10 minute 1-on-1 meeting with their mentor each week. Students will drive these meetings to discuss their goals and plans for the upcoming week, and reflect together on the past week. At Dobie the mentor teacher is the student's Homeroom and 3rd period teacher. What does homework look like? Student's in the Connect program do have homework, but it will look different than what you typically see for homework. Rather than a set of math problems or a worksheet to complete, students are continuing to work through focus areas and projects. It is recommended that students study approximately 4-5 hours a week for their Connect classes. Students will use their goals and action plans that they set at the beginning of the week to help them complete their homework. To prepare students for career and college, we focus on developing cognitive skills and content knowledge in Project Time and Personalized Learning Time (PLT), respectively. Cognitive skills include skills such as critical thinking, analysis, problem-solving, and writing, and are developed through our real-world projects. Content knowledge are specific pieces of information that students learn in different subject areas - such as the quadratic formula or historical events during World War I. They learn this specific content through Focus Areas. Grades show both the competencies students have as well as the growth they have made. We believe that our students will be growing and improving in their abilities throughout the year, and we want their grades to reflect and celebrate that. As a result, students grades are not finalized until the end of the school year. On the progress reports and report cards that are sent home this school year, you will notice that a number grade will not be provided. Students will receive a pass/fail for their Connect classes until the end of year. Your student's grade in their Connect courses are available through the PLP at all times. You may hear your mentor/teacher saying your student is on track or off track. 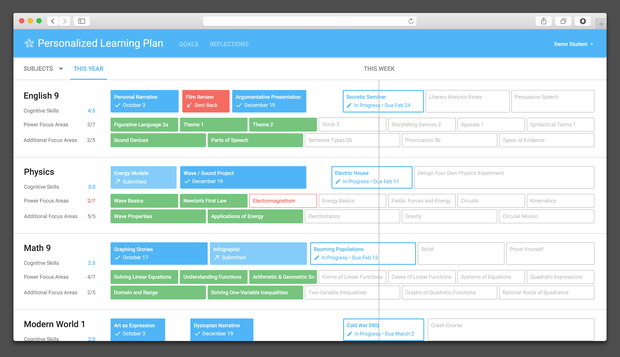 This simply lets you know how your student is currently pacing in the year. Starting with the end of the first six weeks, Connect teachers will report a student’s snapshot grade for UIL purposes. If a student's’ overall grade for a course they are taking in the PLP shows below a 70%, the student will be considered as failing and will lose eligibility; just as they would in any other course. They will be able to regain eligibility at the next three week mark if the student has earned a 70% or above in ALL courses (PLP and non-PLP). As with all other students, a PLP student who has an Incomplete (INC) posted as a grade on a 3 week or 6 week report will be considered as failing that course for eligibility purposes. The parents having an opportunity to interact with the PLP platform and understand how they can use it to support their student. We have already started to schedule Family Meetings for October 10th (this is a holiday for students). If you have not had the opportunity to schedule your appointment, you can do so by clicking on the link below. Click on the button above to schedule your student's family meeting.